MTI Awards were created to celebrate members who showcase their accomplished leadership, participation and industry expertise. MTI grants five types of awards: MTI Value Awards, The MTI Distinguished Service Award, The MTI Chair's Leadership Award, the MTI Project Champion Recognition and The MTI Fellowship Award. MTI encourages members to submit applications to be recognized for their outstanding participation and service. Read below for award information, criteria and presentations. Producer-supplier joint projects that have delivered value to the companies or the industry. (There is no limit to how many companies can be included on a single Value Award application that focuses on a collaborative effort benefiting more than one organization). MTI will recognize Value Award winners at the Annual Members Meeting within the AmeriTAC Meeting each October and at the appropriate AsiaTAC and EuroTAC Meetings each year. Please download the appropriate application below and submit completed applications to mtiadmin@mti-global.org. Please use the Single Application if you are applying for your company only. This would include cases that are focused on realizing value within one or more of your operations. You may have worked with others on a project, but in this case, you will be describing how your company used information from a publication, forum post, or project to improve a procedure, a project or some other aspect of your business. Please use the Joint Application if you are applying in conjunction with another MTI member or multiple members. This would include cases where producers and suppliers (or any combination of members) have worked together on a project or interfaced at a meeting or online, and these organizations have realized value because of that interaction. This smart form includes multiple columns to include more than one organization in your submission. If you have any questions regarding which entry form to use or how to apply for an MTI Value Award, please contact mtiadmin@mti-global.org. 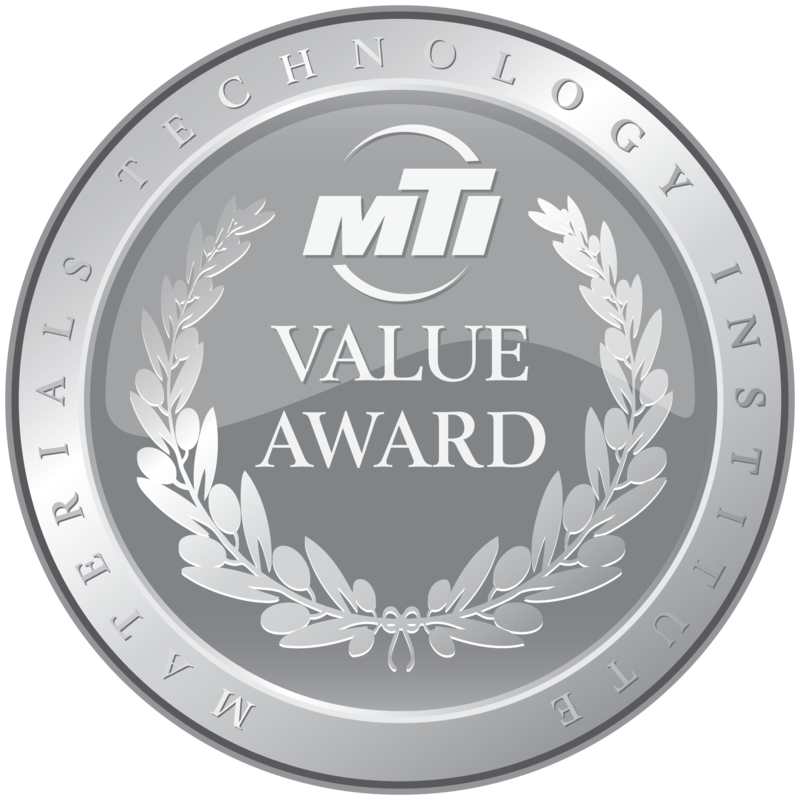 The MTI Distinguished Service Award was established by MTI’s Board of Directors in 2018 to recognize extraordinary service to the organization. This award acknowledges individuals whose accomplishments have made a significant impact on the organization and delivered value to the members. This award will typically be presented to a member with more than five years of service to MTI. • Significant ongoing contributions to the success of a PDC or project. • Significant ongoing contributions to a BOD Committee. • Significant activity and support of MTI member resources, such as ongoing contributions to the TAC forum, TAC Meetings or project teams. • Successful academic outreach, such as ongoing work on MTI-university projects. • Authorship or involvement in publishing several MTI books, guides, or other works. • Overall lifetime service/contributions to the organization. • Other significant activities that have delivered value for several members. Candidates must have made significant ongoing contributions to MTI. Candidates’ activity must cover at least five years of service at MTI. (For example, the nominee for a January 1, 2019 submission shall have been a member of MTI since at least January 1, 2014). Candidates must be from a current member company of MTI. Exceptions will be allowed for posthumous nominations. Candidates may be nominated by members or staff from within MTI only. Self-nomination is not permitted. Nominations must include a detailed description of the nominee’s accomplishments, vision, leadership, and commitment, as well as relevant examples of achievements that fulfill the award’s criteria. Applications can be submitted to the MTI Office year-round. Send nominations to mtiadmin@mti-global.org. The MTI Value Committee will review applications and select winners. Award winners will be announced at a subsequent appropriate Fall TAC Meeting: AmeriTAC (Annual Awards Banquet), AsiaTAC, or EuroTAC. A news release will be issued as well as an announcement posted on the MTI website and LinkedIn page. Question and answer interviews with Award recipients are encouraged for print publication and on the website. Nominations are valid for only one year but may be re-submitted each year up to a maximum of three consecutive years. However, nominations must be submitted after six years of the nominee’s initial service to MTI. Successful nominees will be notified of their election by the MTI Office. Awards will be presented by the Chair (or Vice Chair if the Chair is not present. The MTI Operations Director (or EuroTAC or AsiaTAC AD) will arrange space for and coordinate the details of the ceremony. The Award shall consist of an etched plaque and a personal letter from the MTI Chair. The MTI Chair’s Leadership Award was established by MTI Board of Directors in 2018 to recognize extraordinary leadership at any point during their association with our organization. This award acknowledges individuals who have significantly advanced MTI’s mission through extraordinary accomplishment, example, and vision. The Chair’s Leadership Award signifies the promise of continued success of MTI made possible through the inspiration and positive contributions of new volunteers. Revitalizing a dormant activity, such as a stalled project. Significant contributions to the success of a PDC, such as developing an MTI workshop. Significant contributions to a Board of Directors (BOD) Committee. Contributions key to successful completion of an MTI Project, such as noteworthy involvement editing and reviewing an MTI book. Leading an MTI Roundtable or other event, from its inception to successful completion. Successful academic outreach, such as working as a mentor on an MTI-sponsored university project. Candidates must have made significant, noteworthy and exceptional contributions to the MTI. Candidates’ are after one year of activity with an MTI member company. Candidates must work with a current MTI member company. Award winners will be announced at a subsequent appropriate Fall TAC Meeting: AmeriTAC (Annual Awards Banquet), AsiaTAC or EuroTAC. Nominations are valid for only one year but may be re-submitted each year up to a maximum of three consecutive years. However, nominations must be submitted within five years of the nominee’s initial service to MTI. Successful nominees will be notified of their election by the MTI Office. Awards will be presented by the Chair (or Vice Chair if the Chair is not present). The MTI Operations Director (or EuroTAC or AsiaTAC AD) will arrange space for and coordinate the details of the ceremony. The Award shall consist of an etched plaque and a personal letter from the MTI Chair. The MTI Project Champion Recognition Certificate was established by MTI’s Board of Directors in 2016 to recognize significant effort in leadership of an MTI Project or Project Development Committee (PDC). This award acknowledges individuals who have contributed value to the MTI members by volunteering their time to lead a single successful project. Successful leadership and completion of a funded project as Champion or Co-Champion. Completed service as a PDC Champion. Candidates must have been a Champion or Co-Champion for a successful MTI Project or PDC. Candidates with any length of service at MTI are eligible for this award. Candidates must be employed by a current member company of MTI. Project and PDC Champions will be automatically recognized upon completion of their responsibility. Recipients will be recognized at an appropriate subsequent TAC Meeting: AmeriTAC, AsiaTAC or EuroTAC. MTI will announce the presentation of the certificate utilizing our communication platforms including the MTI website, LinkedIn and MTI Connect. Certificates will be presented by the Chair (or Vice Chair). The recognition certificate will be suitable for framing. The MTI Fellow Award was created to recognize those individuals who have been instrumental in developing the organization’s current prominence throughout its existence. The Board of Directors votes on the candidates in Executive Session by secret ballot. To submit a Fellow nomination, click here. Candidate must be (1) an active or retired employee of a member company, (2) an active or retired MTI Staff Member, or in special cases (3) an outside employee or contractor who made extraordinary contributions to MTI. Candidate may be a present or former MTI Board Member, but neither the member nor any co-worker may participate in the nomination and selection process. For employees of member companies – The nominee must have at least 10 years (not necessarily continuous) of MTI Membership, but he or she need not have been with the same Member Company during this time period. The nominee’s involvement must include successful and productive leadership roles. A leadership role could be Chair of a Project Development Committee, Project Champion, TAC Chair or Board Member. It could also include someone who recruits new members, chairs a symposium, issues publications based on MTI work, helps secure outside funding, or is responsible for some innovation, e.g. website, new corrosion test, or training manual. For MTI staff and outside individuals – The nominee must have 10 years (not necessarily continuous) of MTI involvement, but he or she need not have been involved with MTI in the same way during this period. Nominee’s involvement must demonstrate continuing accomplishment far above the expected level of competence. This could include completing projects that were particularly useful and well received by MTI and industry in general. It could also include someone who recruits new members, chairs a symposium, issues publications based on MTI work, helps secure outside funding, or is responsible for some innovation, e.g. new corrosion test or training manual. Any employee of an MTI member company may nominate a candidate if that candidate is not an employee of the nominator’s firm and meets the eligibility requirements. Designated Representatives and/or TAC representatives from two other member companies must sign the recommendation, i.e. the nomination must be supported by people from at least three (3) different member companies. No current Board Member may nominate nor endorse a Fellow candidate. No current MTI Staff member may nominate nor endorse a Fellow candidate. The nomination form, which should be on the MTI Website, must be completed to justify the nomination. Nominations should be solicited at the October meeting with the hope of announcing awards at the February meeting, however, a nomination can be submitted at any time. At the discretion of the Board Chair, a subcommittee may be formed to review the nomination and make a recommendation to the BOD. The subcommittee may ask for additional information if it wishes. Nominations shall be considered in a timely fashion. If given 15 days notice, the BOD must vote in a secret ballot and/or in Executive Session on the candidate(s) at its next meeting. Information on unsuccessful nominations would not be recorded in MTI Board minutes. A plaque presented at a TAC Meeting to get maximum exposure (and hopefully surprise the recipient). Honorary lifetime access to the member area of the MTI website (not to be used for conducting outside business). No limit should be established. The Board of Directors will vote on the candidate(s) in Executive Session by secret ballot. Co-workers of the nominee are not eligible to vote. A 2/3 majority of those voting is required for approval.